Organizing your movie collection is much more than making a list of it. Apart from helping you to quickly browse through your personal collection, with a movie organizer you can tag movies, add notes, browse the Internet for reviews, information, links etc, and much more. A movie organizer not only helps you to organize your movie collection on hard disk but also DVDs, CDs and VHS tapes you own. Like any software, there are plenty of movie organizers to choose from. The aim of this post is to bring out the best among them. All the softwares listed below are freeware. 1. Personal Video Database is one of the best video cataloguing software that I have found. Adding a movie to the database is easy - just enter the title of the movie and it will retrieve the details from online resources, including plot, actors, director and more. 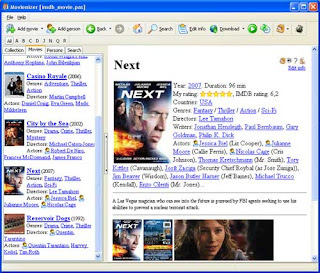 • It integrates directly to IMDB and pulls information out of it. • You can also download a DVD cover and posters from various sites. 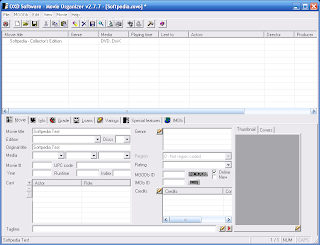 • The interface is customizable with different viewing options like grid, threaded etc. • It has different import/export plugins. You can import information from Excel file. 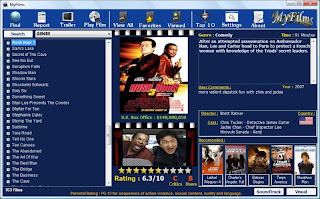 • Movies can be played directly inside this software using the inbuilt media player. The best thing about this software is that there is a SDK (software development kit) available and it supports plugin. So there are lots of useful plugins that can enhance the functionality of this software. 2. Ant Movie Catalog is a free open source program made to manage your collection of movies DVD, CD, DivX, etc and tapes. • Import information from Internet (using scripts); by default it includes scripts for IMDB (US), DVDFR (FR), Allociné (FR), Culturalia (ES), and lots of others. Users can add their own websites. • Scripting technology, using Object Pascal language, allowing to modify catalog: Find & replace, moving field values, etc. • Can store pictures inside catalog or link to external files. Ant Movie Catalog is extremely customizable and it's ability to use scripts adds a lot of functionality and new features to this program. 3. Movienizer allows you to easily find and collect information about your favorite movies. Do you like some actor/actress? Want to find out where he or she is also starring? Just launch Movienizer, select the actor/actress and click "Download" button. You will get the complete list of movies with the given actor/actress, plus important information and photos. Because it retrieves information from the Internet you get anything you wish to know about the movie. Update: Movienizer isn't free anymore. Please see Double Feature. Movienizer will help you keep track on everything concerning movies. With its "loan manager" you never forget where your most valuable DVDs wander. Your personal rating will advise you if some Saturday evening you decide to watch 'a good old movie' with your family or your friends. You can mark the exact location of your media, define movies that you want to see next, inform yourself about future projects of your favorite directors. 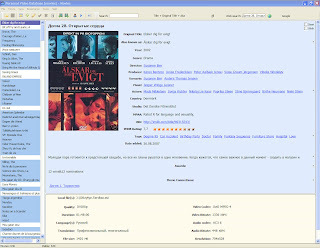 • Create an interactive movie catalog the way you like it. • Customize the content (reviews, pictures, biographies, comments, rating) of each page. • Organize your movie collection by specifying the exact location of every DVD, Blu-Ray disc, HD-DVD, video cassette, or other media. • Find and mark the movies you want to see in the future. • Take snapshots directly from your DVDs or video files. • Add a DVD using barcode. • Play your movies with the built-in player. • List your movies by genre, year, name, director, actor etc. • Take notes about movies that you give to your friends or acquaintances (loan manager). 4. MyFilms is a great looking movie organizing software. It can easily retrieve movie information from IMDB with a single click. Quickly decide which movie to watch according to rating or genre (type). It can automatically add movies to the library; all you have to do is just point to your movies folder. It can play the movie even if it's in two part and include subtitles if needed. It can also retrieve movie soundtrack and plays samples from it. 5. Movie Organizer is a movie cataloguing software that is integrated with it's own online movie database called MOODb, apart from IMDB. When you add a movie to your collection you will be able to search MOODb for information and images which will be downloaded from the net and filled in automatically. You can also upload data to MOODb if you find that something is missing. One unique feature of this program is that you can upload your movie collection to MOODb, and get your own personal Internet URL. Then all your friends can see what movies you have in your collection at any time. 7. My Movie Manager is yet another movie collection managing software for windows that helps you catalogue your personal collection on your hard disk. My Movie Manager will scan your computer for movies, discover video files and attempt to identify them. Successfully identified movies will have their details downloaded from IMDB.com. The downloaded details includes a poster of the movie, the movie plot, year of release, movie rating on IMDB, director, cast, genre, runtime and a couple of others. At the end of the scan you will have a nice searchable database of your personal movie collection. Read full review. Let me report about a new project for a new movies organizer software: "Movie Mania!". Simple but easy and fast: http://zaboilab.com/moviemania . I think it's a good alternative to other more expansive softwares. Not free but cheap as a mobile phone app. Movienizer still claims to be free, but has a splash screen telling you to buy a license, and listing a ton of restrictions. Screw that. Movienizer is dishonest with their licensing. A minor version update wiped my giveawayoftheday activation. Wasted my time setting up my library. I would never consider them now. Personal Video Database is the best application. Easy and clean. MyFilms can share to facebook which brings it to the top of the list. You haven't tried 'Coollector' yet. Its way better than these.. Give it a try, and I'm sure you'll love it.. The best option to me is an online movie organizer. Two reasons, you access your movies from anywhere, and you dont have to care about backups, etc. A very good option could be http://www.movieteca.com. If you need custom info (tags) on your videos more than you need IMDb integration, there's Wwidd (http://wwidd.com). It's open source, cross-platform, and very easy to use. is any of theses SW's work with mac os 10.7 ? and can i organize my movies on my hardisk with ? www.iTrackmine.com is free and not only allows you to manage your movies, but music, books and everything else you own. It's free and in "the cloud" so you can access your collection from anywhere. www.swikat.com is also free and online. You can access your movies, music, books and comics from anywhere. Movienizer is not only expensive for what it offers, be very carefull using the trial, when trying to remove the trial after realizing its not worth it, it destroyed my previous movie files from other applications and databases that i had tried to import into it. THANK YOU ALL FOR PROVIDED INFO. Movienizer is not only not free, but you have to pay for updates or the programme stops. For your digital files i would use MyFilms! Why would you not just use iMDB to look for movies by director or actor/actrice? If you want a free easy to use program to get an overview and play your movies and TV shows, take a look at geoffvideobutler.nl . My favorite is still Movito (http://www.movito.info) , which has a really nice interface and also for easy movie sharing with friends. I recommend Films Manager. You can organize your movies and TV series. It's online so you can connect everywhere and don't have to download and install anything. You can also export your movies to Excel. I recommend The Movie Ninja. You can organize your movies and all done online so you can connect everywhere and have access to it at any time . You can also export your movies list to Excel. The Movie Ninja has a huge library of martial arts movies and also suggest movies for your to add to your collection. sweet !! It's free, works fine ... no nags, no time limitation: just free for all of us as I decided. To create and share movies lists with friends, I would consider RowShare, a new online tool to create collaborative tables. RowShare will allows you to insert all the movies you have already seen or you would like to watch. By the way, each person can edit the list simultaneously, really cool! Just give it a try, it could be useful for you! I know it’s been a while since you asked the question. But since I just found this page, others will follow, so I try my luck.